All materials MADE IN USA! -High quality grosgrain ribbon sewn over durable nylon webbing. -Durable nylon webbing- great for outdoors due to its high abrasion resistance, excellent UV protection, high breaking strength, and resistance to rot & mildew. - Strong and durable side release plastic buckle. - Triglide slide enables collar size to adjust. - Heavy duty nickel plated D-ring for secure leash attachment. If you don't see what you're looking for, please message me with any questions/custom order requests. Get 10% off your order when you spend $45 at this shop. Discount shown at checkout. 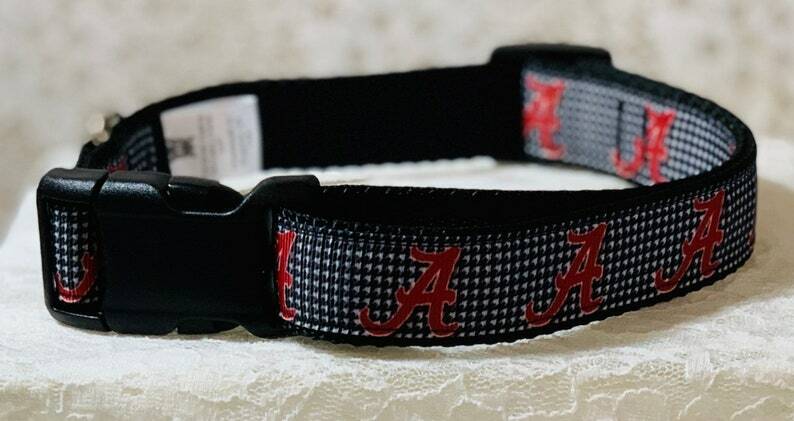 10% OFF Collar and Leash set, or OFF $45 order. Collar looks great and feels great - such nice quality!! Great product, fast shipping, shipped same day I ordered! Thanks Aunt Crystal! I love my new collar!